The Massachusetts Cultural Council through our Wendell Cultural Council has commissioned a trail map of the Wendell State Forest complete with mileages, contours, and locations. 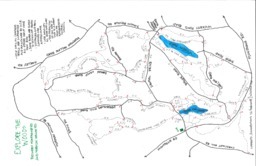 The goal of this map was to enable hikers and families to have a more accurate and comprehensive view of the many recreational opportunities the Wendell State Forest offers. The official Forest trail map does not include distances nor the many unofficial trails that have been built in the forest, giving pause to many potential users. Hopefully this map will help open up the forest to all who care to wander. Explore the Forest Map: Montague Road to Mormon Hollow Road"
The first annual Deja Brew 10K Road Race was held in October 2011 along with a 4 Mile Walk. The race was sponsored by the Deja Brew, where it started and ended. $15 donations were collected to support the Wendell Free Library Playground construction. We had a great turnout for our first race and cannot wait for the second annual race this fall! Thank you to Vic and Patty Scutari for sponsoring the event and offering prizes! Thank you to Chief Ed Chase for keeping the event safe! Thank you to the Diemand Farm and Jody's Mom (I will get her real name from Jody) for prize donations! Thank you to the many volunteers who passed out water, t-shirts, registered runners and walkers, recorded times, and cheered on the participants! Thank you to all the runners and walkers!! Please contact Jody Slade for more information or to volunteer for next year’s race. The first annual SRS Field Hockey Clinic was held for 6 weeks this April and May. Students from Swift River School in grades 3-6 were invited to participate in the free clinic. Participants learned ball handling skills, basic field hockey rules and scrimmaged. SRS provided their sports field free of charge. The RC Mahar Athletic Department supplied sticks, balls, and safety goggles for all participants. Many of the clinic days were run by the Mahar's head field hockey coach - Laurie Saisa. Several varsity field hockey players came to help. Jericho Fellows, a Mahar field hockey alumni and Swift River School parent, also volunteered her time to coach. The participants all did a great job - I cannot wait to see these kids on the field again! We hope to expand this program in future years. Thank you to Jim Woodward, Laurie Saisa, Jericho Fellows, Shelia Hunter, Stacey Senflug, Christine Heard and the Mahar players for all your help! Thanks to all the field hockey players and their parents!!! Please contact Johanna Fitzgerald for more information or to ask about next year. Free swimming lessons are being offered to New Salem and Wendell children from pre-K to fifth grade at Lake Mattawa. Lessons will be taught by the staff of the Athol YMCA Aquatics Program during the weeks of July 9-13 and July 16-20 (with Friday for a rain make-up only). The lessons are one week long. The first lesson group will run from 9:30-10:30 a.m. and the second from 10:30-11:30 a.m. You may register for both weeks, if space is available. Parents must stay for the duration of their child’s swimming lesson. A child cannot attend without pre-registering. Register in person at the Athol YMCA or by calling the YMCA at 978-249-3305. Lessons are sponsored by the New Salem and Wendell Recreation Committees. This committee meets on an as-needed basis.